The year was 1975. The Ali Akbar College was in its seventh year, and bustling with students (mostly “Westerners”) hungry for the Indian classical music, dance and taal being taught in classes given by such masters as Ali Akbar Khan, Chitresh Das, Shankar Ghosh, Zakir Hussain and myriad other guest teachers from India. I was only in my third year of study and in the intermediate kathak class at the time of the initial Sita Haran production. Sita Haran was a full-length production, some three-plus hours long. High tech it was not; brilliant and very dramatic it was, with the superior artistry of Guruji (Pandit Das) and Khansahib (Ustad Ali Akbar Khan) breathing their magic and life into the choreography and music. With Guruji in the role of Ravana, it was awe-inspiring. The production included live music, played by the vibrant AACM orchestra. The original score was composed by Khansahib and his son, Aashish Khan, while Guruji set the parameters of mood, rhythm, and the movement of each item. This music was then arranged and transcribed by George Ruckert for vocalists and the various instruments (sarod, sitar, cello, bass, guitar, flute, clarinet, sarangi, percussion). A small budget and limited resources dictated that we make do —and make it work with simple staging. Make-up was somewhat bare bones, compared to now. We in the original CDDC did not dye our hair or try to make our skin brown, so there were blondes, red-heads, and brunettes assuming the Indian characters without any advantage of looking Indian, for the most part. The costumes were colorful and effective, but not as elaborate as those today. Rama and Lakshman wore top-knots surrounded with carved beads and light orange-saffron material tied around. As I look at the old program, the powerful image of Guruji as Ravana practically jumps off the page—with his piercing intensity and dramatic abhinaya. It was hand-typed and Xeroxed on simple paper, gold in color. Fast-forward to the 2013 Boston Sita Haran production. In spring 2012, encouraged by CDDC/Chhandam Executive Director, Celine Schein, I and a core group within Chhandika decided it would be beneficial to produce Sita Haran in Boston. This resulted in a year-long endeavor, including a hugely successful internal fund-raising effort led by Shelley Chhabra and grant-writing/marketing campaigns spearheaded by Meenakshi Agrawal and Shefali Jain. Many more Chhandika volunteers were to come together during the course of the year and, all said and done, it was a wonderfully successful endeavor. With the support of Chhandam, Chhandika was included in the funding roster of the New England Foundation for the Arts. Chhandika also received recognition and funding from the Foundation for MetroWest and ArtsBoston. 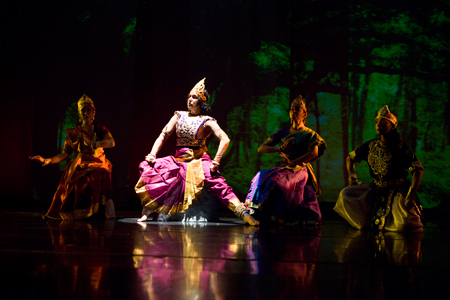 And the Sita Haran production drew the attention of some of Boston’s most prominent dance writers, such as Debra Cash. Those parents and others in the Indian community whom we spoke to in the days and weeks after the production were truly touched by and in awe of the production. Until they actually saw Sita Haran staged in this way, they could not have imagined such a masterful and soulful rendition through kathak. Many were moved to tears. It clearly had a strong and unforgettable impact on their minds and hearts. It was also a moment for the upcoming young dancers in the Chhandika Youth Ensemble to shine on stage, performing a short version of the classic CDDC repertoire item, Rang Manch. They will never forget this opportunity and what an immense privilege it was to be on the same stage as the professional CDDC. Last but not least, the highlight of Guruji coming all the way out here to grace the stage as our Guest of Honor added the crowning glory to this already unforgettable occasion. His presence always uplifts, inspires and is a huge boost to the whole Chhandika community. Although the staging of the Sita Haran production as well as the level of technique now present in the CDDC dancers has changed dramatically from its beginnings in the 1970s, there is much that remains the same. Guruji has an amazing gift for casting dancers in roles that seem perfect for each. He always has. In the process of developing the choreography, he brings out the most from each dancer and requires us all to delve deeply into ourselves in order to understand the character we are portraying and the deeper significance and lessons of the story being told. One striking difference between then and now is the audience base. 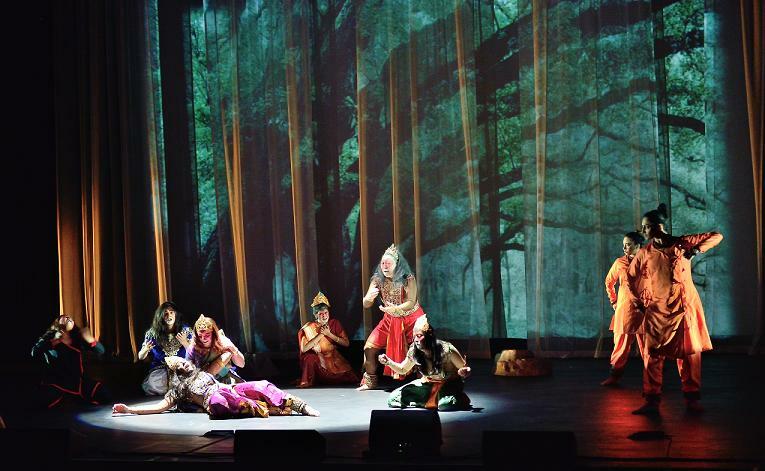 The 2013 Sita Haran production in Boston included an audience comprised mostly of people of Indian heritage. And the production spoke deeply to their cultural roots. Relatively few non-Indians were in attendance. Those non-Indians I spoke to were also impressed and moved by the dramatic rendering. The 1970s and 80s Sita Haran production in California—as I recall—included audiences who were mostly non-Indian. At the very least, the mix was much more 70/30. This was the period when non-Indians were beginning to take in the culture from India, with great curiosity and a thirst for knowledge about it. And just as we were learning about these stories and characters that we did not grow up with, it was the same with much of the audience back then. Yet the openness of hearts and minds brought everyone together through the Indian classical arts. Local dance critic Debra Cash just issued her Top Ten list for this spring’s lineup of dance performances, and we were excited to see that Sita Haran, the dance production choreographed and directed by Pandit Chitresh Das and featuring his dance company, is on the list! Check out the article in the Phoenix, and don’t wait too long to buy your tickets! Bali’s Court, Sita Haran production. Photo by Brooke Duthie. Donate to Chhandika when you shop! Chhandika is a Massachusetts-based, non-profit organization dedicated to Kathak dance. We are affiliated with the Chhandam Chitresh Das Dance Company in San Francisco, California, and the Nritya Bharati Institute in Kolkata, India. Our aim is to provide a stimulating, supportive and multi-cultural environment in which to explore the physical, intellectual and spiritual benefits of Kathak dance as a student, professional practitioner or curious observer. A week in residency, an injection of wisdom and training for a lifetime!